Online transactions for our products are temporarily closed. We are still available to ship out items. For product inquiries, please contact info@haititrust.org. 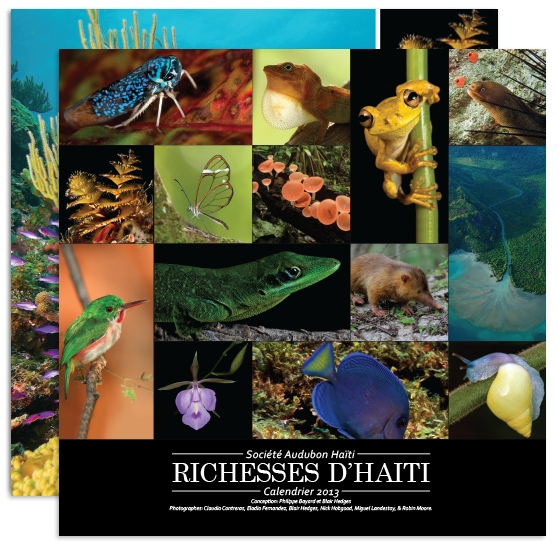 This calendar showcases Haiti's rich biodiversity of plants, animals, and other species now concentrated in "hot spots" around the country, mostly on the tops of mountains. It includes an introduction and map, and each month features a hot spot with explanatory text and professional images from scientific expeditions. Text is in English, French, and Creole. 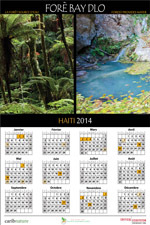 These calendars contain images of Haiti’s diversity of plant and animal life taken by acclaimed natural history photographers along with text descriptions, worthy of display art or future reference. The 2016 printed calendar is identical to the free 2017 digital calendar (see above) except for the dates.